Publisher: John Wiley & Sons, Inc. | ISBN-10: 1118008189 | ISBN-13: 978-1118008188 | Edition: 2011 | 512 pages. 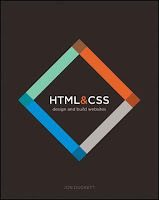 HTML & CSS​​: design and build websites is a book aimed at those who want to build a website from scratch. If you already have a website built using a CMS or Content Management System, blogging software or e-commerce platform, but you want more control over the look of your website pages, this book can be a guide or reference to build your website look like what you want. This book has been redesigned from scratch in order to allow you to study this book. The book is divided into three parts in order to teach you how to make a web page, the first part is the HTML, CSS and then the second and the third part is PRACTICAL. Whether you want to design and build websites from scratch or take more control over an existing site, this book will help you create attractive, user-friendly web content. We understand that code can be intimidating, but take a look inside and you will see how this guide differs from many traditional programming books. Each page introduces a new topic in a simple, visual way with straightforward explanations accompanied by bite-sized code samples. You will also find practical help on how to organize and design the pages of your site so that you can create websites that look stunning and are easy to use. No previous experience needed.